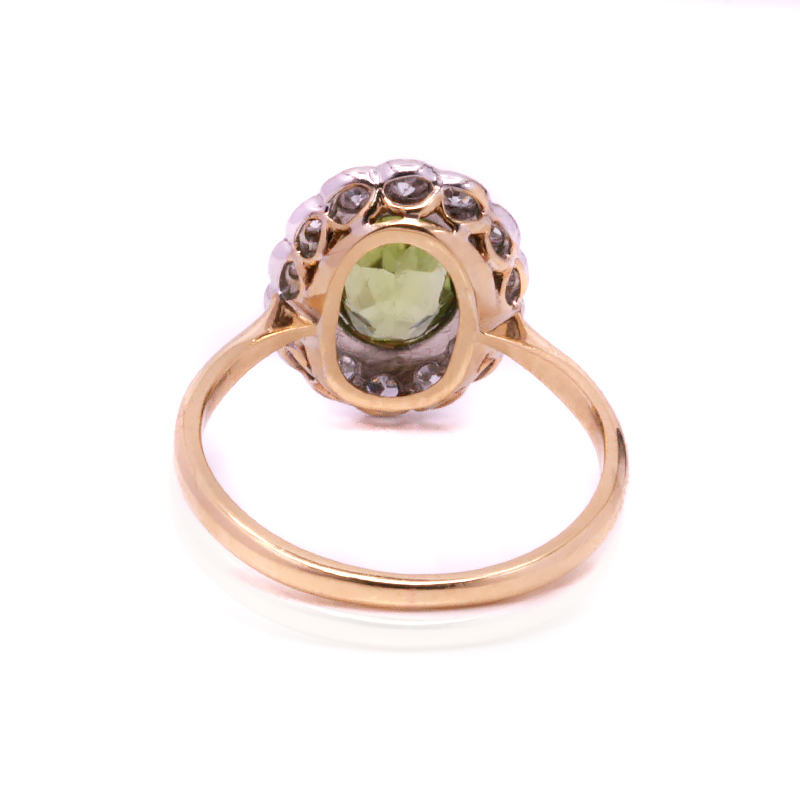 Product code: ES7908 Categories: Sold Items, Sold Rings. Here is a stunning Art Deco peridot and diamond cluster ring from the 1930’s that was hand made in 18ct yellow gold and platinum and will no doubt always be admired by all who see it. With such an elegant and timeless design, this is just one of many reasons why genuine Art Deco rings have remained so popular over the years. Sitting proudly in the centre is the beautiful peridot that measures 1.55 carats and is millgrain set. Like the diamonds which are also millgrain set, this was a technique that was very popular and often seen in Art Deco jewellery and is the elegant and refined crimping along the edge of the setting somewhat akin to the edge of a coin. Adding that extra element of charm and character, it showcases how much attention to detail was put into hand making this ring all those years ago. Surrounded by fourteen Swiss cut diamonds that total 0.56 carats, the top of the ring measures 11.6mm across by 14mm and sits so proudly on the finger. So elegant and beautiful, this style and design of ring has truly stood the test of time and will suit any woman of any age. 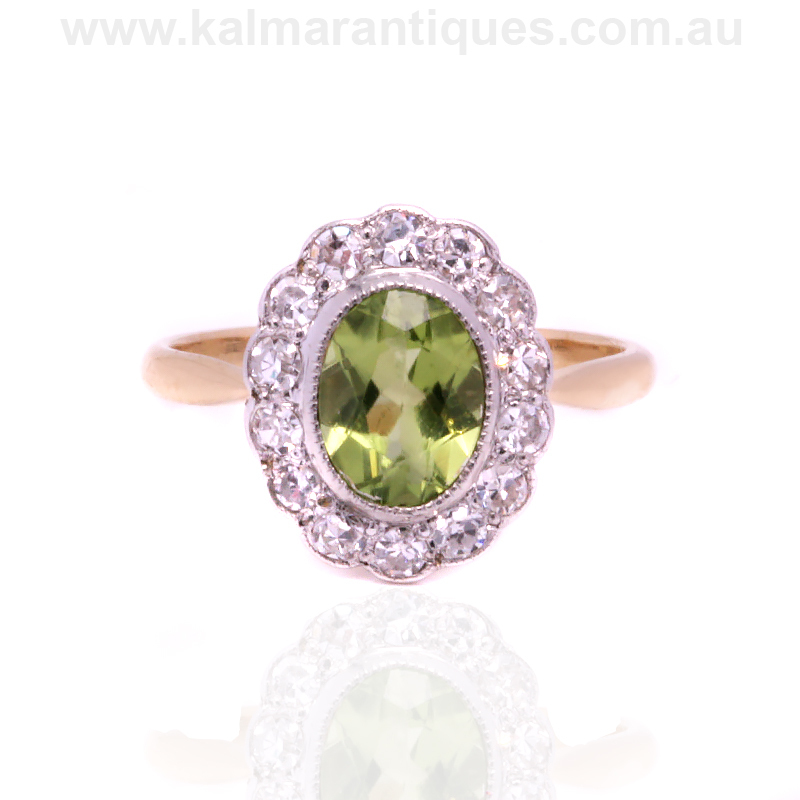 Tag: Art Deco peridot and diamond cluster ring. 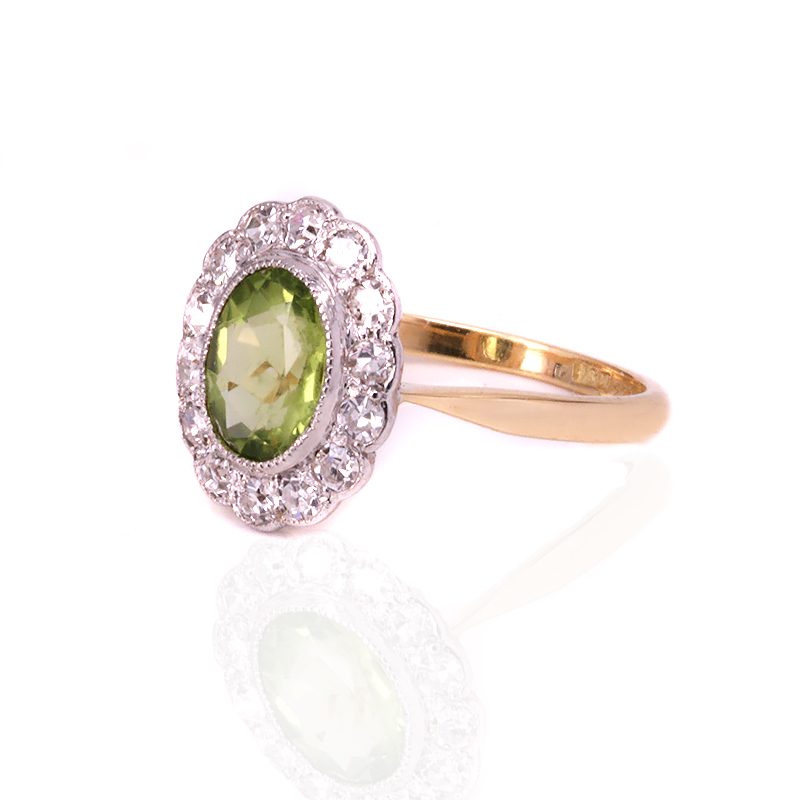 This Art Deco peridot and diamond ring was hand made in 18ct yellow gold and platinum. Beautifully made and designed, it will always look so special no matter where or when it is worn. Genuine Art Deco rings have always remained at the forefront of popularity for engagement rings and seem likely to do so for many more years to come.